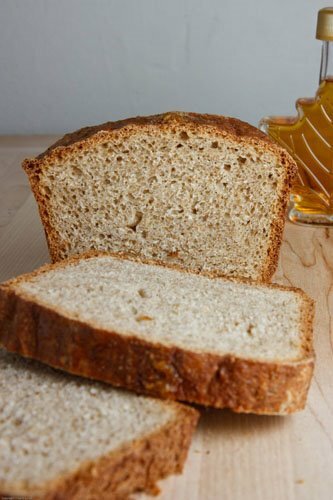 I had been taking a little break from maple but then I came across this recipe for a maple oat bread that I just had to try. This bread is baked with maple syrup in it and maple sugar is sprinkle on top. The maple-y goodness does not stop there though as I had a jar of maple butter that I was just itching to try. In addition to using the rolled oats this recipe also includes some whole wheat flour which I always like to see. This is a yeast based bread so it takes a bit more effort than the quick breads that I more usually make but it is well worth it. The smell of the maple bread baking was just amazing and only built up the anticipation even more. I could barely wait for the bread to cool down enough to cut of a slice to enjoy. The maple bread was great! It had a nice crisp crust with a light and soft inside and the smelled just like maple syrup. The maple flavour however was more subtle and I really enjoyed it. The maple butter that I served with the bread with added a ton of maple flavour as well. The maple butter tasted just like maple syrup but it had the texture of butter. I will definitely be making this bread again. Mix the hot water, oats, maple syrup, butter, salt and cinnamon in a bowl. Add the flours and yeast and stir to form a dough. Place the dough in a greased bowl, cover and let it rise to double its size, about 60-90 minutes. Deflate the dough and form it into an 8 inch long log. Place the dough into a greased loaf pan, cover and let it rise over the edge, about 60-90 minutes. Brush the top with water and sprinkle with the maple sugar. Bake in a preheated 350F/180C for 35-40 minutes. Cover in foil after the first 15 minutes to prevent burning. Un delicious looking bread! Nice texture and looks! There is nothing in the world that can compare with maple butter. 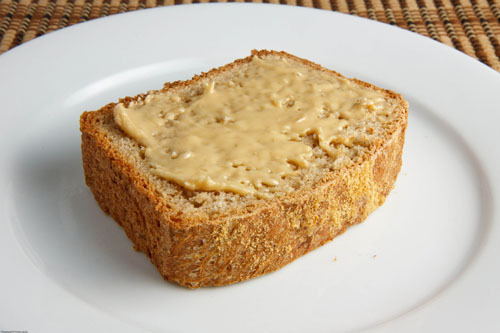 Lovely looking bread Kevin…Oat and maple sounds like a great combo…Your blog is super !! this looks great…I am freak for all things maple, so I will be trying this. thx! Kevin what a great find in that bread sounds wonderful as usual. This bread looks delicious, I love the maple flavoring. Id love some with my hot coffee right now. Yum,Kevin! You are on a maple high!!! Great looking bread! I bet it tasted lovely , eh…I would say divine!! Maple bread with maple butter? I’m salivating! Ive recently decided to start making all our bread from scratch, and have been looking for good recipes. This looks like a keeper! Thanks for sharing so many great recipes! Your blog is fantastic! My two boys and husband are maple fanatics. Looks absolutely delicious! Mmm looks delicious! Never had maple butter, but love honey butter – so probably very similiar! The joy of making your own bread. I love the maply sugar on top. I just got a can from my parents. This is good stuff. Ooh, that description sounds amazing! A perfect breakfast! I’ve got a soft spot for maple too! This bread has been in my bookmark folder and I’m glad to see that it’s good. Thanks for previewing it!!! Wow. Not only are you an awesome cook, but you’re an awesome (yeast) baker, too! Beautiful loaf! The crust has a great color. How did you get that absolutely perfect crust! I love bread with oats, they just add such an incredibly crispy texture, while keeping the bread moist. So great! I’m a sweet-tooth all the way, so sweet breads are the way to go for me. What a great photo. I never thought bread could look so delicious! just found your blog through tastespotting post about mango chutney – your food looks fantastic. you’ve gained a follower =)! Yum! I love fresh baked bread. Maple and oats sounds awesome! This sounds great. I just made the no knead bread today, which is fabulous. Have you tried that yet? How delicious Kevin. Nice crumbs as well. I can just picture that slice nice and warm with melting maple butter…..
That bread would be PERFECT for french toast. Really, it would be faboosh! Maybe with some toasted pecans and some warm maple and blueberry syrup. Mmmmm. It seems like we were both in a bread-making mood! Maple Oat bread sounds delicious Kevin! Yum it looks perfect. I really need to start making bread. This looks absolutely perfect. I love all your maple recipes! This looks wonderful! Yeast bread is a nice change from quick breads, too. That looks extremely tasty, thanks for posting. Wow, Such perfect looking bread! hmmmmm i am thinking french toast or a monte cristo… thanks! oat and maple bread sounds delicious. Oh so delicious!! Wish I could have a slice of this. I’m obsessed with maple things right now. ooh, this sounds absolutely delicious!! Great looking and I bet even better tasting. Fabulous job on the bread Kevin! It’s all your fault, you know! 🙂 After seeing your maple based recipes, I purchased a bottle of the golden elixir just yesterday. My son and husband LOVED it. Your bread recipe looks wonderful. Another great recipe from your kitchen! Looks wonderful – fresh baked bread is one of the most comforting aroma. Really wonderful! I love making yeast breads and the maple flavor sounds intriguing paired with the nuttiness of the flour. Beautiful! I’ll have to try this – but wonder where I can find maple butter to go with it? It looks too good! Fabulous looking bread, I say! The maple butter looks luscious as well! Maple is a great flavoring, and oats always make any batter lighter. A winning combination. don’t take a break from maple! This looks fantastic. wow, it looks delicious. I plan on trying it for Sunday’s brunch, and I was wondering if it would be okay to start it the night before (let it rise through all night the 1st time)? Thanks. That sounds like a concept – the aroma and flavour of maple syrup, and the health benefits of oats and wholewheat flour! Bonus. cathycicek82: I have not tried that. It might be better to let it do the second rising in the fridge overnight. Then let it come to room temperature before baking.